The aircraft carrier USS Hornet was built during World War II, served in the Korean and Vietnam Wars, and recovered Apollo 11 and Apollo 12 from the South Pacific in 1969 before being decommissioned in 1970. She spent a couple of decades in mothballs before becoming a National Landmark and museum now floating in San Francisco Bay at the Alameda pier. As my six regular readers know, my daughter Laura is on the museum staff, and I never tire of telling people that my little girl has the keys to an aircraft carrier. I think Laura had something to do with me being invited to speak and sign copies of Whatever Happened to the World of Tomorrow at last Saturday's "Splashdown 45" event, marking the 45th anniversary of the flight of Apollo 11. But it wasn't entirely nepotism; I believe that at least some Hornet board members independently knew about my book. Still, I think I owe the kid a lot. Did I mention that the star of "Splashdown 45" was Apollo 11 astronaut Buzz Aldrin? That was sufficient motive to rise at the crack of dawn Saturday and leave Comic-Con for a flight to the Bay Area. Got there on time, thanks to my daughter Robin's airport shuttle service. Same clothes I wore at Comic-Con; I travel light. The Hornet is a huge ship that usually swallows crowds with ease, but I've never seen it as packed as it was Saturday. I was talking with the museum CEO and he guessed more than 3500 attended. Buzz Aldrin was scheduled to speak on the big main stage in the Hangar Deck at 1:00. I was slated for the same stage at 11:30, asked to talk on the topic of Space Art and Illustration. I widened that mandate to include a lot of the themes I worked into WHTTWOT: mainly the idea that the stories we tell about ourselves and our future are as important in shaping that future as the hardware we build. "Beat the Commies to the Moon" is as much an aspirational narrative as "Boldly go where no man has gone before." I focused mostly on art and illustration but also ventured into movies, TV, literature, and tried to tie them all together. So I took the big stage and gave a 35- or 40-minute talk that in 162 fast-paced slides managed to name-check Galileo, Hevelius, Cassini, Maria Clara Eimmart, John W. Draper (who took the first photograph of the Moon), Gustav Dore, Jules Verne, HG Wells, Angus MacDonall, Scriven Bolton, Lucien Rudaux, Buck Rogers, Flash Gordon, Frank Paul, Will Eisner, Wally Wood, Frank Frazetta, George Melies, Fritz Lang, George Pal, Chesley Bonestell (of course! 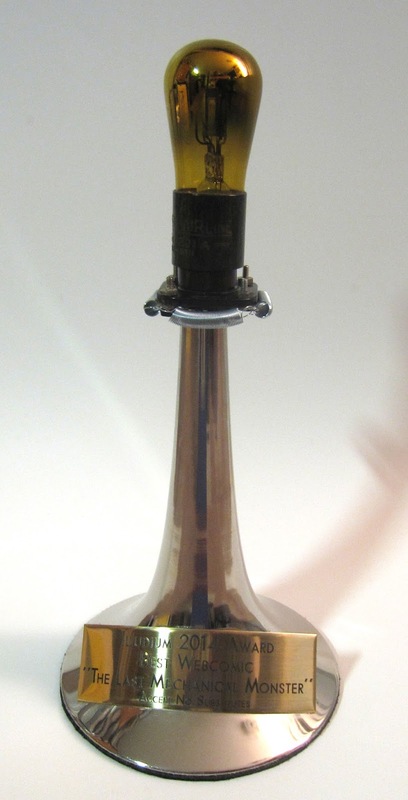 ), Wernher Von Braun, Walt Disney, Charles Schulz, Robert McCall, Ludek Pesek, Don Dixon, William Hartmann, and more. Just reeling off names like that makes it looks like a random laundry list, but I think I was able to build a theme and make a point that people seemed to get and appreciate. The Hangar Deck was set up with several hundred chairs facing the stage, and projection screens and speakers hanging half the length of the deck. It was obviously rigged that way so that everyone throughout the ship could see and hear Buzz Aldrin, but it worked to my advantage as well! At the Hornet's book sales tent. One of these things is not like the other. They had about 1000 of Aldrin's books and 50 of mine, plus maybe another dozen in the museum gift shop. I'm very happy with that ratio. Blah blah blah blah. Why won't this guy shut up? We Want Buzz! Pulling back a bit, my wife Karen took this shot from the first row of seats. The podium was not initially set up with a monitor for me to see my own slides, which would have been disastrous because a lot of my talk relied on a rapid-fire "bang bang bang" clicking through the pictures. The speaker before me resorted to standing at the back of the stage and watching the rear projection on the big screen. I griped enough to the audio-video team that before I spoke they rewired one of Buzz Aldrin's teleprompters to show me my slides instead. Saved the day. Hope they remembered to re-rewire it for Buzz. Stepping farther back into the cavernous Hangar Bay to show one of the screens set up to broadcast presentations throughout the deck. There were three of these screens hanging from the ceiling. It's a big ship. My view from the podium. From the start I had a pretty big audience, which grew as my talk went on. For a little while I thought I must have been orating better than anyone had ever orated before: more and more people were coming to watch me! Slowly it dawned on me that no, they were just staking out good seats to see Aldrin, who was going on 45 minutes after I finished. Still, it also worked to my advantage. Captive audience or not, I was the only thing on the stage at that moment so they had no choice but to sit and listen. After my talk I sat at a bank of tables with other speakers and presenters to sign books. That went splendidly! Not everyone who bought a book got it signed or even realized I was there, but I had a steady stream of really nice people come up to chat and get an inscription. Having just left Comic-Con, I couldn't help noticing that Space People are a lot like Comics People but generally brighter (no offense to Comics People but c'mon!). My book signing set-up amidship. From time to time I had a little line, but nothing unpleasant. People couldn't have been nicer. That's my daughter Robin beside me. This whole family was terrific. Very enthusiastic about the book and posing for photos with its author. That doesn't happen to me very often. I think this guy was hired by the Hornet. I hope this guy was hired by the Hornet. Aldrin was preceded by a short video highlighting the Apollo 11 mission. I was surprised. I've seen the same old footage so many times I thought I was relatively numb to it, but I got an honest-to-God lump in my throat and tears in my eyes watching that Saturn V blast off into the Florida sky. Man. Aldrin was introduced by astronaut Yvonne Cagle, with whom I once shared a pizza. At 1 p.m., Buzz Aldrin took the stage. Topic One of every conversation the rest of the day: how does an 84-year-old man do it? He boarded the ship at 9 a.m., did press interviews for three hours, then gave a one-hour speech, then signed books for three hours, then appeared at a reception and dinner in his honor until probably 10 or 11 p.m. Could you do that? I couldn't do that. I guess once you have the Right Stuff, it never really goes away. Buzz drew a bigger crowd than I did. Buzz's talk touched on his Air Force and academic career before settling on Apollo 11. I'm sure he's told the same "magnificent desolation" stories 300,000 times before, but he tells them well. Then he segued to his current passion, drumming up popular support for manned exploration of Mars. I wouldn't presume to debate Aldrin on the wisdom of that, but will say that he makes his case convincingly and enthusiastically. Preparing for "Splashdown," I jokingly told some people I'd be spending the day "hanging with Buzz Aldrin." In fact, one does not hang with Buzz Aldrin. He had a black-shirted security detail of about six persuasive men who kept the respectful mob at bay. He also had one handler whose main job was being the bad guy so Buzz didn't have to. No, you cannot have a private word with him. No, he will not shake your hand. No, he will not sign your photo. Buzz's book signing was a rapid assembly-line process--necessarily, given the hundreds of people in line. I had no special access, just queued up with everyone else, wondering what I might say to the Great Man when I had the chance. What hasn't he already heard 30 million times before? What could I possibly say that he might chuckle at and remember at the end of the day? Maybe something smart and obscure, a question about orbital rendezvous (the subject of his Ph.D. thesis) or his Gemini 12 mission? 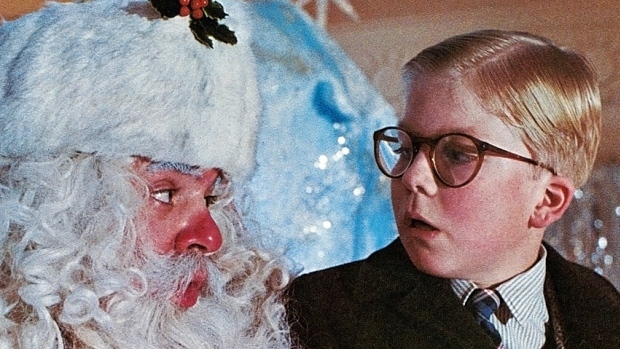 In the moment, I froze up tighter than little Ralphie meeting Santa Claus in "A Christmas Story." To be fair, I only had about two seconds to spin around for Karen to snap a photo and spit out my carefully crafted bon mot. I believe I said, "It's a great honor to meet you." He looked up and said, "Thank you." Yeah, I'm pretty sure he's still got that original insight rattling around his brain. I should have asked him for a Red Ryder BB gun. After the day's main public event, Karen and I stayed for a VIP reception. Here, again, you get a unique perspective on spending time in the orbit of one of the most celebrated men in the world. Buzz came to the reception and seemed accessible--he was 10 feet away! Yet actual interaction with him was defined by invisible circles enforced by his polite but firm security team. Only certain people got inside the circles. I wasn't one of them. Here's what I mean. It appears that I could just walk over to Buzz's table and share a nice drink with him. There he is! Right there! But if I'd taken one more step in his direction, a large man would've gently taken me by the elbow and steered me away. This is no criticism of Aldrin. I'm sure it's what he has to do to manage the millions of people who "only want a minute of his time" and get through the day. I just found it a fascinating glimpse at what goes into being Buzz. It was impressive and a little sad. I imagine it gets very tiring. As it was, this was a very special day for me. In addition to spending the day on the Hornet (always fun!) and making such a memorable impression on Buzz Aldrin, I think this was my most successful speaking/book-signing event ever. My talk went very well. The museum sold all of its WHTTWOTs, so that by the end of the day I was doing sketches for disappointed people who hadn't been able to buy my book. That never happens for me. I opened my talk by saying that if I had a time machine and went back to tell 1969 Brian that someday he'd be standing in that spot, on that ship, speaking on the same stage that Buzz Aldrin would be taking in less than an hour, there's no way I could make him believe it. 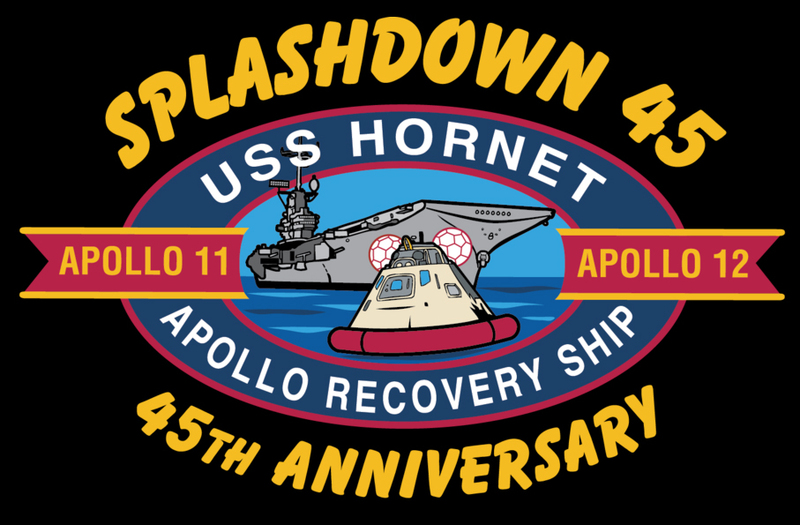 "Splashdown 45" pushed every emotional button I've cultivated for 45 years. I was Buzz Aldrin's opening act. Lifetime achievement unlocked. 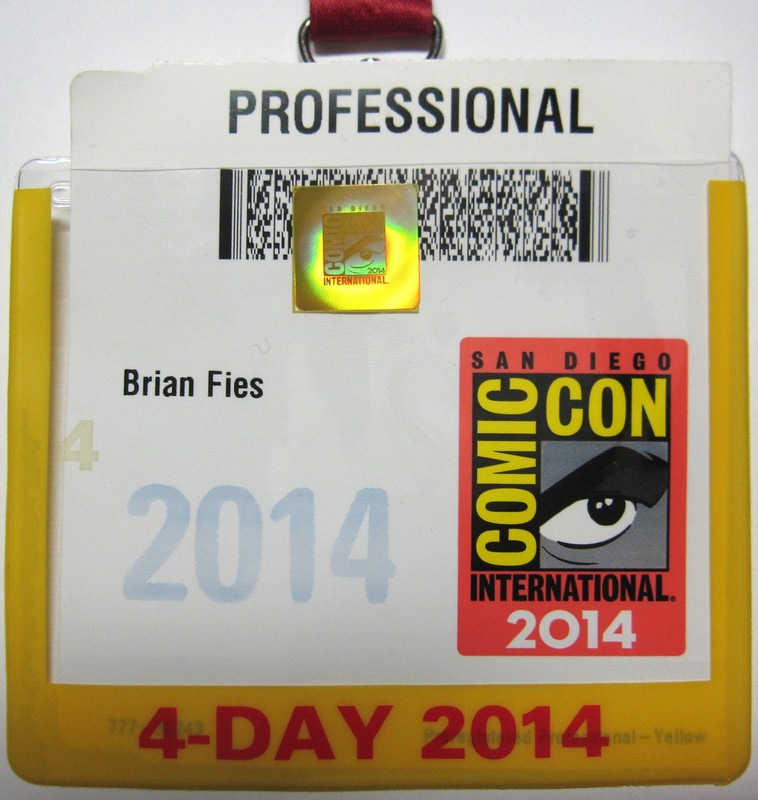 I arrived home safe and footsore from Comic-Con International in San Diego last night. Hard for me to believe, but I haven't attended since 2010. Things have changed a bit, in ways I'm not sure improved the experience for me (I'm trying to say that nicely). By and large, for an event that tries to safely entertain 150,000 people for four days, the organizers pull off a miracle, and they were very kind and helpful to me. I attended Thursday afternoon and Friday. The best part for me was seeing many friends, and meeting some people who until now have only been Facebook or e-mail acquaintances. Also, a teaser: I know the two nicest people in the world. I'll tell you their names at the end, but just wanted to let you know now that if you've been searching for the two nicest people in the world, call it off because I've found them. This report is a photo essay, punctuated with bits and bites of notes. IMPORTANT QUALITY CONTROL NOTE: Many of these photos are blurry/hazy because I didn't notice until I got home that my camera lens had a greasy fingerprint smeared across it. Sorry; no do-overs. Thursday began at the tiny Charles M. Schulz Sonoma County Airport. I didn't catch a plane here; I caught a bus to a bigger airport two hours away. I just wanted to show what your local airport looks like when they name it after a cartoonist. Seemed an appropriate launching point for a trip to Comic-Con. Approaching the venue. My impression: a bit less street theater than at past Cons, and maybe fewer costumes. I talked later with comics journalist Heidi MacDonald and she thought there was less activity in the blocks around the convention center because people who owned vacant lots and parking lots that in the past had hosted events had raised their rates too high. Could be. But the center itself, and the sidewalks around it, were jammed. Spiders and Turtles, oh my! I only include this photo because I read today that Daniel Radcliffe (Harry Potter) had attended Comic-Con disguised as Spider-Man, so maybe that's him. Or he could have been one of the 75 other Spider-Men. Hard to say. Cartoonist Todd Clark ("Lola"), writer/cartoonist Ces Marciuliano ("Sally Forth," "Medium Large"), and comics podcaster/journalist Tom Racine. Tom was one of those Internet friends I'd never met in person, so this was neat. Ces I met once seven years ago, an event he pretended to remember and then mixed me up with someone else and apologized for it every time I saw him. Todd I just met 20 seconds before taking this photo. My pal Otis Frampton, whose "Oddly Normal" series has just been picked up by Image Comics. Couldn't happen to a nicer, harder-working guy. Apparently there's some movie coming out about Hobbits and a dragon? I loved the get-up of this lady, who was kind enough to let me take her photo. She dressed up her wheelchair as the Star Tours ride at Disneyland! What a concept! One of the best costumes-slash-vehicles I saw the whole time I was there. My pal Lex Fajardo ("Kid Beowulf" and the Schulz Studio) drew sketches to support the Cartoon Art Museum in San Francisco. People could pay $10 and have an artist draw whatever the customer wanted. I did this for an hour on Friday, and drew a 1940's-style Wonder Woman, the Punisher's skull logo, a mermaid, and Chewbacca playing basketball. Chewbacca is hard to draw. I also had a chance to talk to the museum's Andrew Farago about the joys of new fatherhood. He still seems dazed. Original comic strip art by cartooning great Bill Watterson and some guy named Pastis, which is currently being auctioned to raise funds for Team Cul de Sac and Parkinson's Disease research. The comic book without which none of us would have been there this weekend. I took this photo for my daughters: a sort of steampunk/superhero mash-up. If there's one theme I noticed emerging in cosplay, it was the mash-up: My Little Pony Hulk and so forth. Anyway, here are some ideas that might inspire someone. My editor at Abrams, Charlie Kochman, introduced me to "Family Circus" cartoonist Jeff Keane. We also talked with "Luann" creators Greg Evans and his daughter Karen, standing behind Jeff. Greg pretended to be insulted when I said I thought Karen's contributions had made his comic strip a lot sharper. Or maybe he wasn't pretending. At the National Cartoonists Society (NCS) booth: Greg Evans and master MAD caricaturist Tom Richmond. For the first time at any Comic-Con, I ventured into the Pro Lounge. What wonders awaited within? What sparkling wit, reminiscent of the Algonquin Round Table, would I overhear amid the tables piled high with fine pastries and exotic sliced meats and cheeses? Steeling my courage, I timidly flashed my badge at the door and entered the sanctum sanctorum of comics' elite. I found a water cooler and plastic cups. But they were a professional water cooler and plastic cups, with ice, so take that, plebes. Back in the streets, the Assassin's Creed video game people were letting folks run through an obstacle course. Because swinging from a rope in San Diego is totally the same as jumping across rooftops in Renaissance Florence. What's nice about San Diego is that the whole city gets into the Comic-Con spirit. Wherever you go, retailers and service people at restaurants, shops and hotels decorate and dress for it. My hotel had a bellhop in a Superman cape. Here's the municipal trolley cars advertising the "Agents of SHIELD" series. "Excuse me, can you tell me where to find Nickelodeon? I heard it was around here somewhere, but can't seem to find it. They should do something to make themselves more visible." Actual costumes from all the modern Batman movies were on display. Wandering the aisles, I heard a woman's voice calling out "Free Science Comics!" Those being my three favorite words, I stopped to talk. Turns out she's a cartoonist with a Ph.D. in physics making comic books via the American Physical Society. When I mentioned that I'd majored in physics, her eyes lit up. I'd said the magic word. 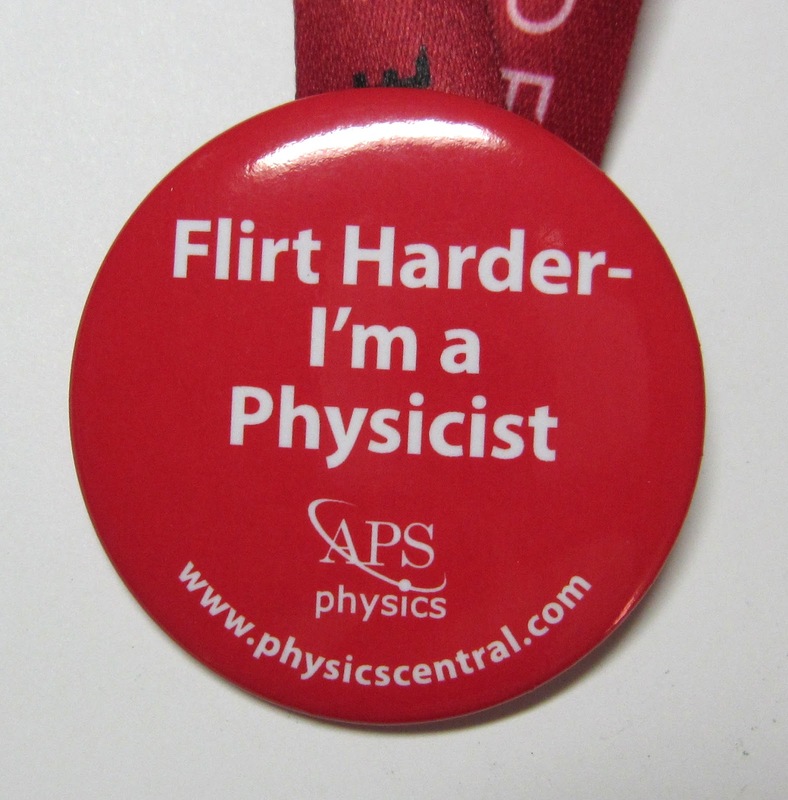 "Oh, we have something special for people who say they're in physics!" And now I have this pin. I sought out and introduced myself to Tom Bancroft, who does an online comic I like called "Outnumbered." That "Comic Code Authority" t-shirt I'm wearing was one of my few con purchases for myself. Tom was there with his brother Tony, who among his other accomplishments directed Disney's "Mulan." They both have terrific-looking books available. Very nice guys, I was happy to meet and talk with them for a few minutes. A little slice of home at the Peanuts booth, which was popular. Schulz Museum Curator Corry Kanzenberg is mugging for the camera, but I think her expression reflects genuine overwhelmedness as well. I caught up with Keith Knight and his son, and bought Keith's latest collection. Kid has a lot of energy. Pal Justin Thompson ("Mythtickle," the Schulz Studio) was at the GoComics.com booth signing nice little prints for passersby. Justin is one of the coolest people I know if only because of his previous jobs: Renaissance Faire jouster and theme-park stunt-show Batman. I envy him his resume. This boy had a great Ant Man costume. You probably haven't heard of Ant Man yet, but just wait'll the Marvel movie comes out in a couple of years. Quicksilver, Hawkgirl, and Magneto mix up their comic book franchises. ...one on the fairly loose theme of making a living from your passions, or something like that. I didn't understand it and neither did the panelists, but it was a nice conversation. It was moderated by comic book writer Mark Waid, who's standing in this photo. I either saved or nearly ended the life of Mr. Waid, I'm not sure which. After the panel I approached the podium to introduce myself, because I'd been told he'd seen and liked "Last Mechanical Monster." He smiled, extended his hand to shake, and took one step toward me right off the edge of the two-foot high platform. He sort of fell, I sort of caught him, the audience gasped, and he leaped up like a Russian gymnast with a jaunty "I'm all right!" Close call. I took this photo because five minutes earlier I'd seen the terrifying Klingon on the left sitting at his table with a small make-up mirror applying his eyeliner. Q'aplah! Batman and the Joker. Honestly, looking at this photo, I don't understand why the Joker doesn't win every time. Friday night, pre-Eisner Awards, Tom Racine hosted a drop-in "Drink and Doodle" gathering at the hotel bar. That's Justin Thompson, me and Tom. As part of the "Drink and Doodle," Tom passed out blank sheets and asked everyone to for their take on the theme "75 Years of Batman" (this is his anniversary). This was my contribution. Drink and Doodle. Some great people came and went, including cartoonist Rina Piccolo, Ces Marcuiliano (in the back right of this photo), and cartoonist Frank Jordan.The right-most guy in this photo is Disney storyboard artist Jeffrey Ranjo, who shared some stories about "Frozen." 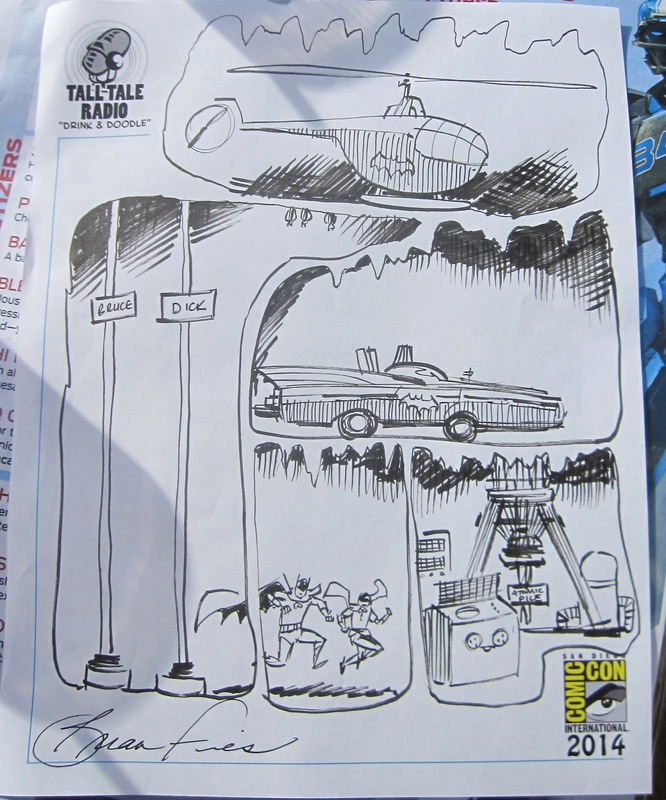 Also at the Drink and Doodle, I gave Tom Racine 10-to-1 odds that I was going to lose the Eisner Award. He took my bet, and gave me $1 against $11 I would owe him if I won. Also in the "Drink and Doodle" photo are my sisters, Brenda and Lis, who drove down just to surprise me and show their support at the Eisners. Which is where we are headed here, dressed so nicely. With Jason Walz and Kathy Bottarini. Jason wrote a great Eisner-nominated book called "Homesick" and we've corresponded; one of the highlights of Comic-Con was finally meeting him and his wife Emily. Kathy was one of this year's Eisner judges and also runs a comic shop not too far from my town. Jason and I were grateful to her. I promised to divulge the names of the two nicest people in the world, and now it can be told. For nearly 40 years, Richard and Wendy Pini have created and nurtured the universe of "Elfquest," a pioneering work of fantasy comics and literature. Aside from "Lord of the Rings," I'm hard-pressed to think of any body of work that's had a bigger influence in that field. Anyone attempting to make a comic touching on the lore of elves has to deal with the groundwork already long laid by Tolkien and the Pinis. Richard is an astronomy buff who contacted me when Whatever Happened to the World of Tomorrow came out. We've corresponded, and he's kept up with (and often commented on) The Last Mechanical Monster. On Friday he told me he'd just caught up with Mom's Cancer, and we talked a bit about our families. The placard reads: "Illudium 2014 Award. Best Webcomic: The Last Mechanical Monster. 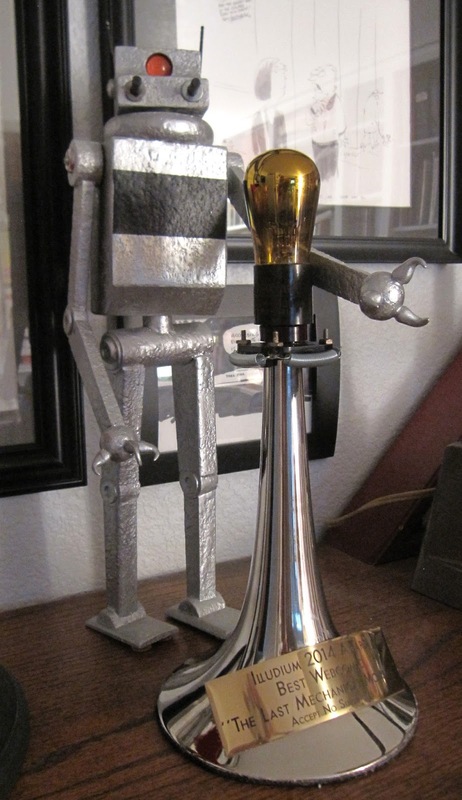 Richard built me a trophy himself, from a tapered silvery base topped by an actual gold-tinted radio vacuum tube, exactly like those that power the Robot in my webcomic. Wendy had tears in her eyes; mine may have moistened a bit too. This is the most unexpected, thoughtful, nicest thing anybody's done for me in a long time. I just have such respect for them and their work, and to turn around now and have them do something like this for me.... Holy Moley! Wendy, Richard, me, and my Major Award. My Major Award at home atop my drawing desk. I think I'm pretty good with words, but I can't even tell you what that means to me. I just want it on the record that I picked it. I also got to keep Tom Racine's dollar, so that eased the sting. Next morning I got up very early and flew back to the Bay Area for another important engagement. That's the topic of my next blog post.